Recently on the market appeared backpacks for mobile gadgets and laptops, with the sewn (or built-in) powerful solar panels. Many companies are engaged in the production of such functional devices. Unfortunately, often the quality of these products leaves much to be desired. Nevertheless, conscientious developers do not lack attention from consumers, because more and more people today tend to choose high-quality and durable products. Solar panels of the latest generation can charge not only the phone or player but also support many hours of work on tablets and laptops. 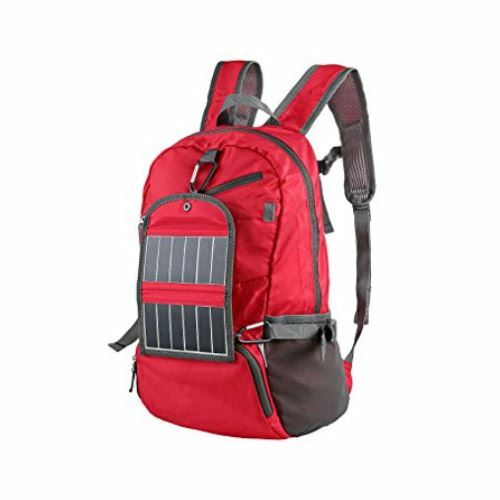 Irrespective of the manufacturer, backpacks with solar panels are thought up from an ergonomic point of view and have a large number of pockets for placing both electric and completely ordinary stuff in it. Since not everyone is aware of how to select the right one solar backpack, we’d like to introduce our choice of the best packs on the market. With the new OffGrid Solar Backpack it’s easy to get power anywhere you are. With 10 Watts of high-efficiency solar power, this solar powered backpack charges all USB devices including Apple, Android and Blackberry smartphones. Charges all tablets that are powered by USB including Apple iPads and Samsung Tablets. However, it will not charge tablets that charge at 12 or 16 Volts. Charges both DSLRs and cameras that charge from USB. 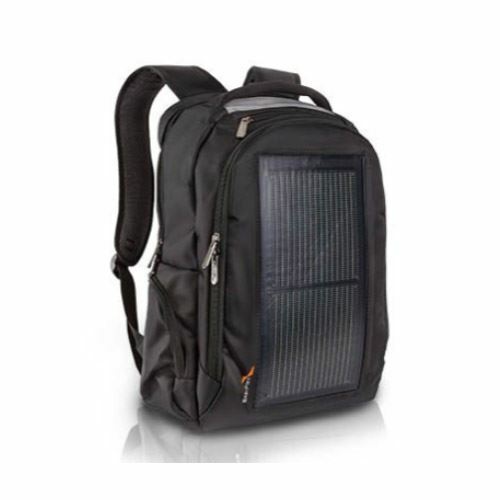 Includes: OffGrid Solar Backpack + V44 USB Battery, USB Charging Cable – charges V44 battery from any USB port. MicroUSB Cable – connects battery to devices that charge from MicroUSB. 25L of storage with smart pockets for charging devices on-the-go. There are padded laptop/tablet sleeve, large main storage compartment and plenty of convenient storage for cables, adapters and tablets. There’s expandable water bottle pocket with tri-pod carry strap. Backpack itself is made of recycled PET (soda bottles) and is waterproof, lightweight and UV resistant. The back section has a breathable mesh shoulder harness for ultimate comfort. Solar panels are 10 Watts at 6 Volts, which are also waterproof and UV resistant. Panels use 22% efficient SunPower cells with ETFE Coating. The backpack is rather heavy when it’s fully loaded. 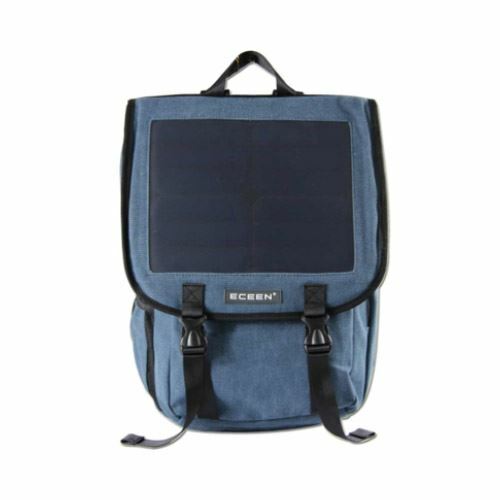 ECEEN solar backpack is capable of generating more electricity per 1 panel. The power drawn goes into the large-capacity 10,000mAh power bank which is waterproof and works as a handy backup battery when you’re outdoors. All the energy that is absorbed by the solar panel is safely stored to be used by emergency battery backup. To charge the device you have to hang the solar panel charger on the back of the backpack so that it is able to draw energy from the sun during the day. The process of attaching is easy thanks to the convenient clips. Ultra light and portable solar charger backpack designed for the modern tech-savvy generation. The Solar bag has 1.8 liters water bag inside, allowing you to hydrate any time. The front flap features a light-weight, flexible, integrated solar charger for your cell phone, iPad or tablet. Solar panel is detachable. The waterproof PVC fabric guarantees great performance and reliability, and weighs less than 3 lb. 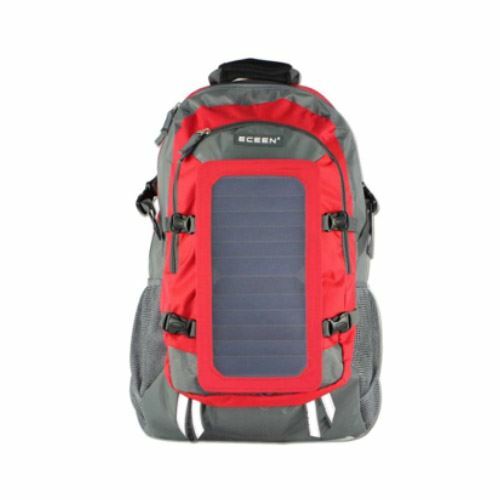 ECEEN solar charger travel backpack has high-efficiency 22% transfer rate solar cells, a 5V USB port, and protective Voltage Stability Control, which prevents unstable or damaging currents. Poor quality of zippers. The side pockets made of mesh come apart and out of use. The EnerPlex Packr Commuter is sleek solar integrated backpack that charges different electronic devices in a few hours. The backpack is integrated with flexible ‘solar on plastic’, which is seamlessly incorporated into the pack. The flexibility and durability of the solar panel makes it to be of a high-quality. It is a special backpack, along with a couple of main compartments, some smaller pockets and adjustable straps, you can find other unique features of it. The front of the case is actually a flexible solar panel, and it’s hooked up to a small battery inside that’ll charge your smartphone or tablet over USB. Interior compartments with several pockets and charging pass-through. There’re 2 external zippered pockets for water bottles. Business supply compartments for pens, business cards, and more. There’re padded, adjustable shoulder straps. The main pocket contains space for a 15-inch laptop and a tablet. There are also two smaller pockets that work well for storing mice or power cables. There’s no internal battery in the backpack, so you can store the power. Large phones don’t fit in the charging pocket. To make it work properly you need really great sunny day. 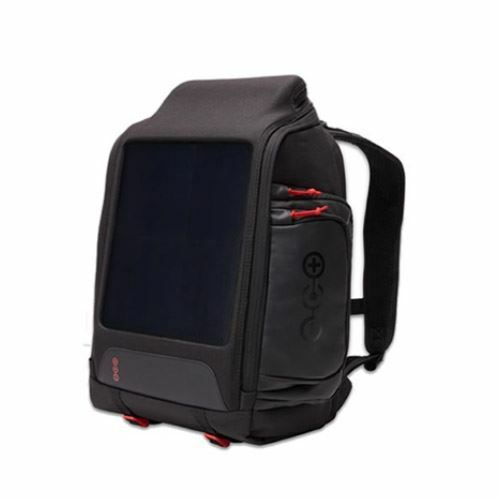 This solar powered backpack provides 10 Watts of power and great for storage of all gear and devices. Panels are waterproof and UV resistant with urethane coating. It charges all USB devices like smartphones, all known tablets. Only a few tablets require an optional adapter. Charges DSLRs and cameras that charge from USB. However, DSLRs, optional camera charger cradle that matches your camera battery is required. It also charges nearly all 15″ and smaller laptops. Includes: Array Solar Laptop Charger +V72 Laptop Battery, Car Charger Socket – 5.5 x 2.5mm, Laptop Output Cable – connects to Laptop Adapters, AC Charger – charges V72 battery from AC, DC Charger – charges V72 battery from DC. Backpack provides 25L of storage with smart pockets for charging devices on-the-go. There are padded laptop/tablet sleeve, large main storage compartment and plenty of convenient storage for cables, adapters and tablets. Expandable water bottle pocket with tri-pod carry strap. Fabric of backpack made from recycled PET (soda bottles) and is waterproof, lightweight and UV resistant. Doesn’t include an instruction or any information about the use of the backpack. SolarSak is designed with adjustable suspension that is able to have a range of torso lengths and features a tightly stretched mesh back panel, padded shoulder straps, and a dual density foam hip belt which offers ventilated comfort. SolarSak is made of a lightweight water-resistant ripstop Nylon with breathable EVA foam straps and an external frame with a bearing system so long-distance trudge and shock resistance is maximized. The solar panel is a rugged waterproofed monocrystalline panel coated with protective urethane for protection against the elements. The back side holds a waterproof neoprene pouch with a battery strap and USB dock for charging power-bank and other accessories. The backpack features waterproof 7W SUN solar panel with neoprene pouch for rugged durability. There’re external frame and adjustable suspension for a secured fit. It has survival features and it’s equipped with buckle survival whistle, reflective night patches, bag rain cover for enhanced safety and protection. It includes a 2L hydration bladder so you can carry your water with you. It may take a lot of space when empty rather than traditional backpack. The metal frame may squeak and requires lubrication. This backpack charger provides free unlimited on-the-go power with solar panel and hydration! This is the perfect choice for any outdoor activity. It comes with plenty of pockets and compartments for maps, documents, and essential gear. It’s made of high-quality, rugged fabric making it great for backpacking, fishing, and so much more. Also, since it is a ultra-light and ultra-durable, tha backpack is perfect for day-to-day use or occasional travel. It’s made of rip and water resistant nylon and poly fabric. Backpack’s stress points are reinforced with bar tacking for increased longevity. 7-Watt high efficiency solar cells sunpower with 22% transfer efficiency, are built into a protective anti-scratch hardened coating and sewn into high-wear PVC fabric for weather-resistant outdoor durability. Battery features 10,000 mAh waterproof li-polymer battery pack that can charge smartphones, external battery packs, GPS units, MP3 players, Bluetooth speakers, and much more. A great plus of it that it includes 1.8 liter hydration bladder pack. Charge a variety of devices directly through a 5-Volt USB port, equipped with the protection of a voltage stability controller. 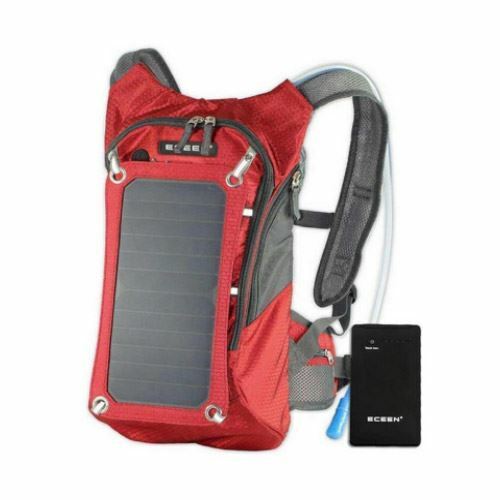 The package includes ECEEN solar powered hydration backpack, 7-watt solar charger panel, 10,000 mAh waterproof power bank, one micro-USB cable, and user manual. The bag space can be a bit small. The price is also high for it. The backpack does not suitable for overnight hikes. 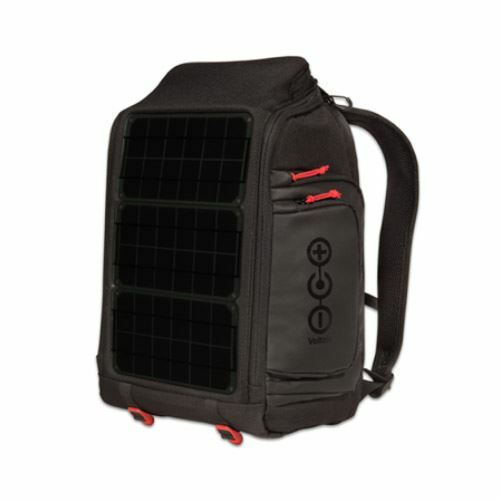 The Solar Power Bag is a backpack with all of the functionality features with the addition of a solar charging module. The Solar Power Bag has pockets for cell phone and as well as enough space for a laptop. The front flap features a light-weight, flexible, integrated solar charging a phone or tablet. Solar panel is detachable and has a powerful new technology that charges a dead device very quickly. A powerful 10,000 mAh Li-Polymer, lightweight battery designed with cutting edge solar panel technology. It’s great to have if you need go travelling or for any other activity. It charges your device using the 10Watts 22% high efficiency sunpower solar cell. Solar Power Bag is a strong, durable and flexible backpack made by canvas material. Features a 36 liter waterproof backpack, which includes most popular Micro USB cables. 10000mAh battery is also waterproof and lightweight. It’s fully charged by sun in just 6 hours, fully charged by outlet in just 6 hours. The battery can charge full 3-4 mobile phones. Consumers claim there’s no connection when you plug in the device to charge. The ECEEN solar powered daypack is an ideal small daypack for various activities. The perfect size is great for essentials. It folds up into a compact carry pouch that will take little space or weight in your other backpack or handbag. The backpack is perfect for day-to-day, which is made from highly rip and water resistant fabric, provides strength and long-lasting performance with minimal weight. Stress points are reinforced with bar tacking for increased longevity. 3.5 Watts foldable solar panel removable from main pack. 22% high efficiency transfer solar cells in a protective anti scratch hardened coating sewn into high-wear PVC fabric for weather-resistant outdoor durability. Built-in 2,000mAh slim and waterproof Li-Polymer battery pack charge smart phones, External Battery Packs, GPS systems, MP3 Players, Bluetooth Speakers and other devices without direct sunlight too. The packaging includes ECEEN Solar Powered Daypack, 3PCS Carabiners, USB to DC and Micro USB cable, and user manual. Backpack can be folded into zippered inner pocket to fit anywhere. Unfolds from pocket to backpack. The fabric of the backpack is rather thin and in size it’s small. The battery doesn’t charge phone to the fullest. SunLabz provides lightweight, travel-friendly solar-panel backpack. The anti- scratch solar panel is encased in a lightweight, durable, weather resistant PVC fabric that can withstand all outdoorsy odds. For this backpack are used only highest efficiency solar cells, providing 22% transfer rate, guaranteeing the most reliable performance. Ultra-Smart and Efficient technology assures worry free compatibility with the fastest charging speed for Apple, Android, Tablets, and USB Powered Devices. 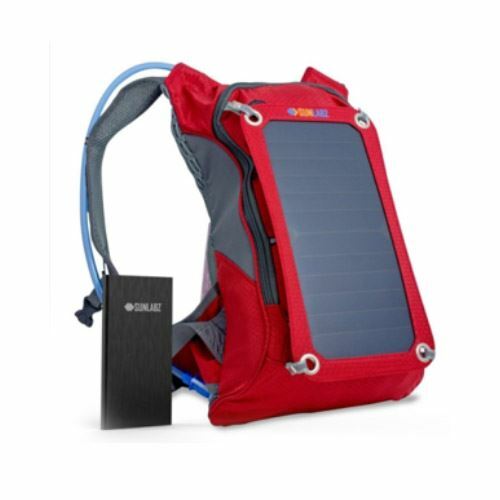 Solar Charger Backpack with 1.8L hydration pack and ergonomic carrying system. It includes 10,000 mAh PowerBank. It easily can charge a cell phone, digital camera, tablet, GPS, and Mp3 player. High efficiency solar cells with 22% transfer rate. There’s a protective Voltage Stability Control, which prevents unstable or damaging. The solar panel takes too much time to get charged under the sun. This backpack charges gadgets thanks to the energy received from the sun by its monocrystalline panel, which receives it and accumulates it in the battery. This device is equipped with adapters for almost all popular brands of devices, and also equipped with a mini USB adapter. To make the right choice, you need to determine what this backpack with built-in solar panels is for. Going on the road, the traveler will certainly take care of fully charging before the exit all his gadgets – phone, photo and video camera, laptop, navigator, player. If it is a short (one or two-day) trip out of town, it is unlikely that someone will take a laptop to work on it without interruption until the battery is completely discharged. And for recharging the batteries of any other portable device, a relatively small solar battery is sufficient. It is difficult to imagine that during the journey the sun will always shine only in the back, allowing the batteries to produce the maximum possible electric current. That is why, the panel should be removable, but with the ability to mount on the backpack in such a way that during the movement it is possible to provide the maximum charge current. The system of fastenings of such a panel should be that it can easily be fixed, for example, on a tent. The weight of the solar backpack matters if you’re going on a long trip. It’s obvious that the backpack will weight a lot as you take all the necessary stuff so the lighter backpack itself is the better. However, heavy solar backpack points at higher volume and power. The volume of the solar backpack depends on its use. Compact backpack can be used in town or for 1-2 days trips. The big backpack is great for longer trips, so you can put plenty of things. Again, this feature depends on what you’re going to use this backpack for. The solar capacity and battery power depend on how often you use your electronic devices. There are solar backpacks that provide enough energy to keep cell phone charged. It’s great when you use the phone only when there’s a strong necessity. 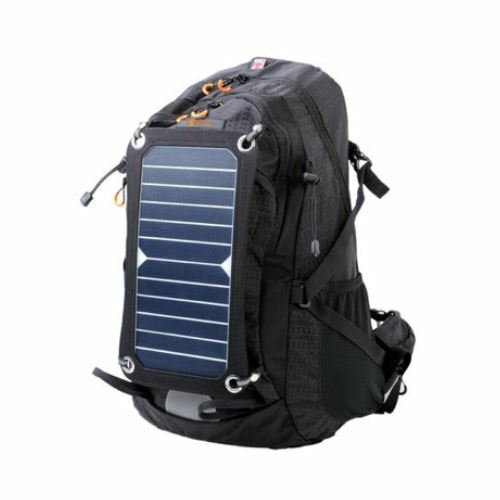 Other solar backpacks can charge smartphone, GPS unit, DSLR camera and laptop. This is a great choice, who travels far and for a long distances. The cost is always a major factor in choosing items. The price for the cheapest and expensive solar backpacks should be defined by their features. High price solar backpacks usually have better quality, increased durability and weight less. The really good one backpack that is able to charge any type of electronic device cannot be cheap. You simply can’t charge electronic devices while the solar battery is charging. You only can charge the device when the panel is full enough of solar energy. If you charge devices during the day then the solar panel is not able to refill its energy. It’s better the backpack have as many USB ports as possible. Most solar backpacks come with only 1 port so it’s possible to charge one device. Expensive backpacks come with 2 ports and more. If you’re going to use it charging more than just a phone then you shouldn’t save money for a cheap one model. Taking this backpack outdoors means it should be tough and it’s better the pack is made of nylon. This fabric can resist the water, it’s tough and rather durable. The seams of the backpack and stress points should be reinforced and triple stitching also should be included. Consider that the pack has to be flexible and able to take the elements. As a rule, solar panels are located on the most sun-exposed part of the backpack. The backpack design provides for them a special pocket-compartment, fixing the batteries and protecting them from mechanical damage. The battery itself is a thin flexible sheet with thousands of photoelectric converters needed to transform the energy of the sun into electric current. The resulting energy is stored in a battery with a USB port, for which there is also a special place in the backpack. The most powerful models of solar panels and batteries can be used not only for charging all kinds of gadgets, but also for lighting tents, the work of small household appliances up to 150W. The capacity of built-in backpacks batteries in some models reaches 24 000 mAh. Choosing the solar backpack depends on your needs and the devices you tend to use.